Carroll Gardens, Brooklyn is known for its families, strollers and green space, but now it can add one more thing to the list - New York City’s very first self-powered residential building. The Delta by Voltaic Solaire will meet 100% of its energy needs without tapping into the grid, and will be unveiled next week to the press. The Delta was inspired by Mayor Bloomberg’s PlaNYC goal of reducing New York’s carbon emissions by 30 percent by 2030. Voltaic Solaire’s philosophy is to start small by making individual buildings both energy-efficient and self-sustainable. The Delta is also an Empowerment Zone, which is part of the U.S. Department of Energy’s Rooftop Solar Challenge, which calls for communities to introduce clean solar power into their power stream by installing solar panels on their neighborhood rooftops. The Delta’s solar roof is mounted atop the building like a trellis, giving residents a shaded roof deck below. 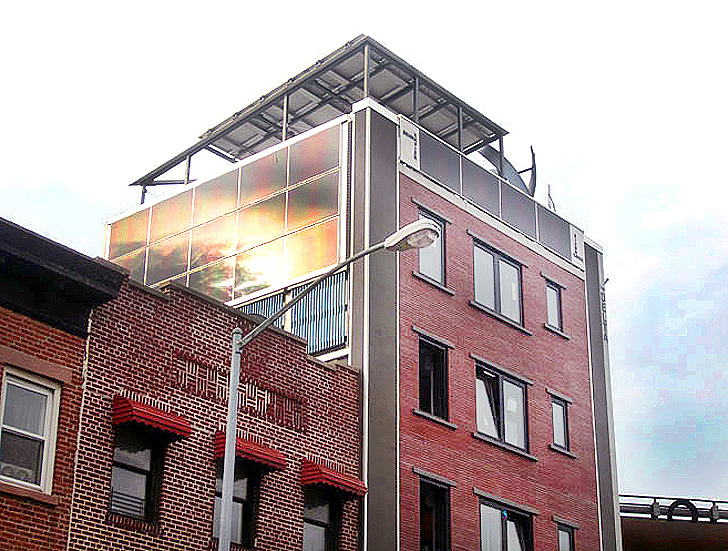 A solar skin, solar awning, and panels combined yield a capacity of 10.3 KW. Additionally, the Delta’s solar thermal system creates 140,000 BTUs. To harness wind power, the roof is outfitted with a vertical axis wind turbine that generates 600W of power almost soundlessly. Each of these components work together and send power back to the grid, making enough energy for the building to power itself and then some. The Delta is constructed from green and recycled materials, including recycled aggregate cement and bricks. The building holds one grand triplex apartment, a studio residence, as well as a retail or restaurant storefront. Other developers should take the Delta’s lead, proving that city living can be cleanly powered and off the grid. if it is a Residential building then there is a minimum of 10KW of HVAC power requirement per unit, the roof plan only shows one wind turbine hmmm… One turbine is not enough to power the whole residential building at night. I hope they have some backup power to from the power company as NY in not Chicago (windy city). Delta was inspired by Mayor Bloomberg’s goal of reducing New York’s carbon emissions by 30% by 2030. Voltaic Solaire’s philosophy is to start small- by making individual buildings both energy efficient, and self-sustainable. The Delta is also an Empowerment Zone, which is part of the U.S. Department of Energy’s Rooftop Solar Challenge, which calls for communities to introduce clean solar power into their power stream, but installing solar paneling on their neighborhood rooftops. The Delta’s solar roof is mounted atop like a trellis, giving residents a shaded roof deck below. A solar skin, solar awning, and panels combined yield a capacity of 10.3 KW. Additionally, the Delta’s solar thermal system creates 140,000 BTU’s. To harness wind power, the roof is outfitted with a vertical axis wind turbine that generates 600W of power almost soundlessly. Each of these components work together and send power back to the grid, making enough energy to power itself and then some. The Delta is also constructed from green and recycled materials, including recycled aggregate cement and bricks. The building holds one grand triplex apartment, a studio residence, as well as a retail or restaurant storefront. Other developers should take The Delta’s lead, proving that city living can be cleanly powered and off the grid.